The Town of Huntington played a significant role in the defence of liberty and independence. Almost a quarter of the town's male population volunteered to serve the patriot cause. Numerous documents and artifacts survive to verify our legacy. 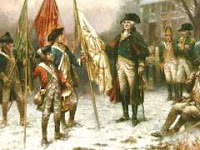 The descendants of these patriots, Sons of the American Revolution, Daughters of the American Revolution, The Ancient and Honorable Huntington Militia, organized themselves to promote the principles of the Revolution and to preserve our history. To honor these organizations, the Huntington Town Clerk's Archives will have an exhibit, "The Legacy of the Revolution" . The Exhibit will feature documents, and military equipment from the Revolutionary War era.